About 400 flights were cancelled at Schiphol - one of Europe's biggest airports - and about 200 in Brussels. Travellers have been advised to check flight updates at home, rather than set off for the airport in bad weather. 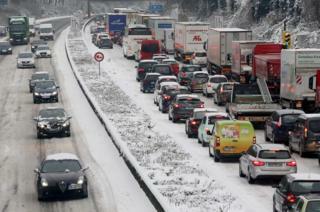 In Germany the heavy snow has caused many car crashes and traffic jams, as well as train delays. More than 300 flights were cancelled on Sunday at Frankfurt airport, the busiest in Germany. The Dutch airport at Eindhoven was temporarily closed because of the snow, and many Dutch schools remained shut on Monday. Conditions improved later at Brussels airport, where planes were able to take off from one de-iced runway. But Brussels Airlines scrapped all its flights. In the UK, dozens of flights were cancelled at Heathrow and road conditions were described as treacherous in many areas. The heavy snow left thousands of British homes without electricity and hundreds of schools were shut on Monday. In France 32 regions were put on an emergency "orange alert" footing, as a storm nicknamed "Ana" battered the Atlantic coast, with winds gusting as high as 150km/h (93mph). Later the alert was reduced to eight regions in the north and far south. There were also avalanche warnings in some French Alpine ski resorts, after a metre (3.3ft) or more of fresh snow fell above 2,000 metres. Nationwide at least 120,000 homes had power cuts on Monday, most of them in the Loire Valley. The motorway section between Calais and Boulogne was closed after heavy snow in northeastern France. Snow also spread southwards to Italy, causing some travel disruption in northern regions. The snow caused the closure of schools in Liguria, Piedmont and Tuscany, Italy's La Stampa daily reported. Ferry services to the islands off Naples were suspended because of strong winds.